One of the most cost-effective ways to get in front of new and existing customers is to send an oversized postcard. While email is also a valuable way to stay in touch, the fact is that some people respond better to direct mail. Why use an oversized postcard? It’s cheaper than a tri-fold brochure or letter. Even with full color front and back, an oversized postcard is a lot less expensive than paying for folding and an envelope. It will often get hand-delivered to each recipient. Most companies will distribute a post card or other direct mail piece right to your recipient’s desk. If your postcard is big, bright and colorful, it’s likely to get attention It works for both new customers and existing ones. A postcard is an easy thing to send to past customers letting them know about new and upcoming events, products or services. And it’s also easy to rent a targeted direct mail list to help acquire new customers. Overall postal volume is down. Have you noticed that you’re getting less mail than you used to? Most companies are cutting back on direct mail, and the post office is trying to figure out if they should stop delivering mail on Tuesdays to save money. With this trend, there’s an opportunity for your message to get through easier. With less overall mail coming to each person, there’s a greater likelihood that people will pay closer attention to your mailer. 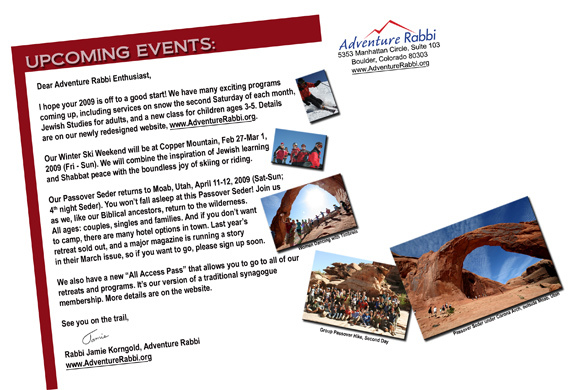 Here’s an example of a postcard we just did for my wife’s organization, Adventure Rabbi. In the past, we’ve sent out a tri-fold brochure or a four page business letter with a brochure. This year, to save money, we opted for an oversized postcard: The front has two photos on it (I took them) that features upcoming events. The psychological goal for using these photos is to allow the recipient to place themselves inside the photo and say, “Yes, I’d love to take part in this experience.” The back of the postcard uses the same color theme, and features a message that goes into more details about each upcoming event. 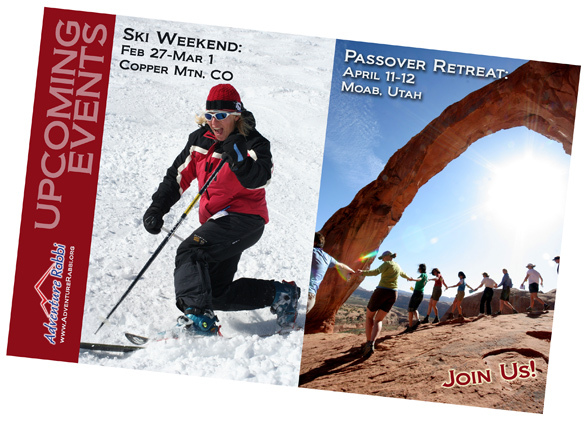 The back also has a series of smaller photos that attempt to connect with the recipient on an emotional level, and cause them to visit the website to sign up for the Ski Retreat or Passover Seder in the Desert. Here’s the back: In a tight economy, where discretionary income for travel is at a low point, reaching out with a postcard saved the Adventure Rabbi organization money, as well as enticed people to spend money.